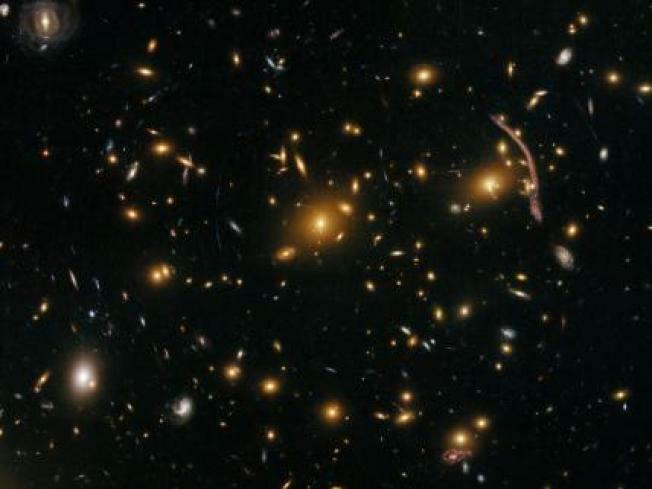 We have no idea what Saturday night's sky looked like, but this galaxy cluster sure looks like a bunch of strange lights to us. "Did anyone see the very bright light in the southeast sky around 7:30 p.m. [Saturday], Sept. 19 that looked like a spotlight and then faded quickly out? We first thought it was the moon going behind a cloud, but realized there [was] no moon out..."
Well, Loren in Rockville, that was actually a rocket you saw. Launched in Virginia by NASA as part of an experiment. And, according to the AP, the blast may have caused dozens of people to report seeing strange lights in the sky. Earth's atmosphere. About the time of the launch, dozens of people in the Northeast started calling -- or, in Loren's case, e-mailing -- local television stations to report seeing odd lights in the sky. The calls came from as far away as Boston, which is about 380 miles northeast of the launch site. properties of noctilucent clouds, which occur at high altitudes.